You are here: Home / Giveaways / I’m going to Disneyland with…YOU? 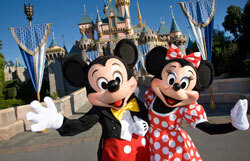 I’m going to Disneyland with…YOU? So, I’ve been keeping a little secret – a secret that makes my heart dance and my eyes sparkle. Okay, it’s actually a BIG secret. The good people at Disneyland have invited me and my family to come to the park in late November (Nov. 20-22, to be exact) to be dazzled by the holiday displays and festivities. We’ll ride Dumbo, Peter Pan, It’s A Small World, Splash Mountain, Thunder Mountain Railroad, and Soarin’ Over California. We’ll watch a parade and a spectacular fireworks show. We’ll rest our heads at the end of each fun-filled day at one of the Disneyland-branded hotels. AND we’ll even attend a special VIP Holiday Party specifically for bloggers. Does that sound magical and magnificent? Oh, yes. Wait – there’s more. Oh, I’m positively giddy. The BEST part of all is that I get to invite one of YOU to come with me. If you’re not from Tucson/Phoenix, but you can arrange for transportation to Disneyland, the rest of the package could still be yours. So this is open to anyone, anywhere. To me, Christmas is about giving – our hearts, our hands, our time, our love. What I want to know is how you and your family give to others. ROUND I: In 150 words or less (less is totally fine, by the way), tell me what you and your family are doing to impact the world for good. If you’re not actively doing anything, tell me a dream or an ambition that you have for the upcoming year. Send your thoughts to christmas@metropolitanmama.net. The deadline to submit your entry is Monday, October 19, at 11:59 pm. ROUND II: My family and I will select the top 5 entries. The selected top 5 finalists’ submissions will be posted here on Metropolitan Mama on Wednesday, October 21. Metropolitan Mama readers will then have three days to vote on the most compelling story. NOTE: The 5 finalists will be required to submit a photo. Candlelight Bubble Bath Spa Gift Basket ($69.99) – What better way for a mom to relax than to soak in a nice warm tub (preferably with a good book and no banging on the door by kids in the house)? This “sensational” basket includes citrus bath balls, a soy candle, a loofah mitt, a body net, and hand and body lotion. Chocolate Gift Basket Stack – Sweet Decadence ($39.99) – Chocolate crunch, chocolate cherries, chocolate brownie cookies, chocolate covered pretzels, and a chocolate bar. I just said “chocolate” 6 times in one paragraph. Wow. Just Wow. As Erin would say. Tea & Cookies Gift Basket Stack ($39.99) – Inside you’ll find red raspberry tea, peach iced tea, David Rio chai, raspberry lemon tea cakes, classic tea cookies, and a teaspoon sweetener. A good cup of tea is so rejuvenating sometimes, don’t you think? Healthy Gift Basket Stack ($34.99) – Contents include: honey wheat dipping pretzels, amazing raspberry honey mustard pretzel dip, bountiful harvest granola, Tuckerman’s trail mix, and metropolitan trail mix (perfect for the METROPOLITAN Mama reader – ha!). Gourmet Gift Baskets offers baskets for all occasions, starting at $24.99. If you have a friend who is celebrating a birthday, just landed a new job, recently had a baby, or is going through a hardship, consider GGB. To enter for a gift basket, leave a comment stating which of the four gift baskets you would choose if you won and who you would give it to (it’s okay if you’d give it to…yourself). For an extra entry, subscribe to my newsletter (see right sidebar) and leave a second comment telling me that you did (if you already are a subscriber, just say so). Comments will close on Monday, October 19. There’s no way I’m gonna ride the teacups (I’d get sick in a second). You *might* be able to convince me to ride Tower of Terror…but only maybe. My hair will likely be out-of-control frizzy when you see me – California humidity does that. I’m still so sad we didn’t get to chat at BlogHer, but I’m going to be in Los Angeles the 20th-22nd, too. My sisters, mom and I are spending the 20th at Disneyland… which day are you going to the park? I’d love to meet up, if only for a few minutes! I WANNA COME!!!!! THAT SOUNDS LIKE FUN!!!!! Lucky you! What a fun giveaway! Have fun at disneyland! I would love to win the spa basket and I would give it to a friend who just finished going thru treatments for breast cancer to brighten her day. I would give the Chocolate Basket to my friend who is returning to work at the end of the month after having her new baby! Oh yea, btw if I’m not able to win the trip, I would love a gift basket, the Tea and Cookies gift basket stack looks unbelievable, my sons would enjoy it. If I kept it for myself, I’d go for the chocolate basket…but for giving I’d go with the Healthy basket! I hope you have fun at Disney! What an amazing giveaway! Have a blast at Disneyland! The chocolate gift basket would make a great gift to my husband. Thanks for the chance! WOW, what a great giveaway!!! I can’t wait to read the winning entries. At this point, I don’t think I have the brainpower to write something, or work on getting votes, but I’d love to enter for one of the baskets. Since I am low on energy and brainpower I should choose the healthy or the candlelight basket, but hey, that would be sensible. If I’m lucky enough to win and have a choice, I would be all about the chocolate. Wow. Just wow. Says it all. Second choice, healthy, then candlelight, then tea. Have fun and say “hey” to the Mick-ster for us! My kids have never been to Disneyland! They have begged us! They would love it!! It would be a dream come true! Thanks for connecting Stephanie. Love your blog and your contest. WOW! I’d love to have the chocolate gift basket for my husband. Thanks! What an exciting contest! How cool it would be to take my four kids to Disneyland for a few days free of charge! I would love to give the Tea & Cookies Gift Basket Stack to a co-worker (and friend) who recently put a good word for me and helped me land one of my dream jobs! I WOULD LOVE TO GOOOOOOOO!!!!!!!!!!!!!!!! and i would pick the Healthy Gift Basket! ;) it looks like it is FULL of Delicious goodies!!!! i will advertise this giveaway on my blog… but i really hope i win this!!!!!! I would love to win the chocolate basket for my mom! She is the best Nanny ever and always treats our family to fun things. What an amazing give-away. Last year we did Disneyland during Halloween, this year we plan on doing it during Christmas. The bath and the healthy baskets are my favorite. Mmmmmm, the chocolate one looks fabulous, but I am also a health nut. I am going to be good and go for the healthy gourmet basket! I would love to take my little boy to Disneyland for Christmas! To me Christmas is all about giving, I love seeing that smile on a face when you’ve gifted them a perfect gift. The thing we do to spread the joy is we pick an angel off the Christmas tree the age of our son and when he’s older he’ll pick out the gift for them. For now we take care of that :). Next year I think we might adopt a family for the year. Also I love to volunteer at the food bank when I can. Ok, I think I am going to try! :) Otherwise, I like the chocolate gift basket! Nummmy! What does Christmas mean to you and your family? I hope it means spending time with the ones you love. One tradition that I kept from when I was a little kid was going to church on Christmas Eve with the whole family. It was a special time for all of us. I have four children so Disneyland is EXPENSIVE for us. We don’t live in CA. so going ther is not an eveyday thing. I love the idea of gift baskets!! The chocolate one would be heaven!! What a great contest. I love Disneyland and gift baskets! WOW!!! I forgot to mention that I would love the healthly basket for myself. I know, I should give it away but with blood sugar issues, I need all the help I can get. If I get any other one I would give it to a my friend who could sure use a big pick me up right now. I don’t live in LA but I would make the trip out there if it meant I could spend some quality time with my family at the most magical place on earth! My two kids have never been and I’m sure they would love it! This is an awesome giveaway. I would so much love to go to Disneyland. It would be so much fun – my two daughters are exactly the age of your daughters! Unfortunately, I am not brave enough to undertake a trip to CA right now with two of them. I would love a spa gift basket. I would give it to my sister in law who just had a major surgery. I forgot in my last comment to say which gift basket I’d want. I’d choose the Healthy Gift Basket Stack and share it with my whole family. We’re all trying to eat healthier before the Holiday’s get here. I subscribed to your newsletter too! This is such a great opportunity! I would choose the chocolate gift basket and give it to my sister! Oh I wish I could enter the Disneyland prize just so that our familys could meet in person. Unfortunately the date lands just a few days after my daughter’s surgery so we won’t be able to travel. Crossing my fingers an opportunity like this will come along again! I wish I could go, but I have to stay home and do my Mom duties! What a great giveaway. I would love to win any of the baskets. I would give it to my sister who has had a rather hard last couple of years. She is a single Mom and works full time and she is getting ready to graduate in December with her Masters Degree. I am so proud! Steph- This is the first time I’ve read your blog. It’s beautiful. That picture of u is absolutely GORGEOUS! I love chocolate & I hope you and the family have a great time at Disneyland. I live in Utah but I’d gladly drive to LA to experience Disney with my kids, who have never been!!! I can’t think of a more magical time to visit the most magical place on Earth. THANK YOU so much for the chance to win. I’ll get working on my entry! No way can I make it to Disneyland, but I’d love to win the Chocolate Gift Basket Stack. Have fun with the lucky winner! Would love to come to Disneyland but I’m in Chicago and we are getting ready to pay off our Jamaican vacation (Dec. can’t come fast enough ha ha) so it’s just not possible. The healthy gift basket sounds nice and I would give it to my mom and dad. I would give the chocolate basket to my amazing mother in law who has been helping us out! This is a really awesome thing that Disney has done for you. I will take my chances and enter. The bath gift set looks good to me. I love disneyland! The last time we went, I got really sick the whole time and so did my little one. I just wanted to go home. I would love to go and enjoy it this time. Also the gift baskets look so good. and by the way, there can never be too much Disneyland!!!!!!!!! First, BEST GIVEAWAY EVER! If the timing weren’t so crummy for us (parents coming up that very weekend for a visit) I’d be all over the Disneyland contest! What a bummer for me, but I’m still so excited for whoever gets it, and I can’t wait to read the finalists’ entries! Ok, so for the gift baskets, I would choose the healthy one as a gift to my husband. He really likes having healthier snacks on hand at his office. I would choose the “Candlelight Bubble Bath Spa Gift Basket” & I’d give it to myself :) I deserve a little pampering, right? This is such an awesome giveaway and contest! I can’t wait to read the finalists! I would love the healthy gift basket for my good friend Brandi who is a travel nurse and would love to get a thinking of you gift basket in the mail! What an awesome trip giveaway! And it is a few weeks after my annual pass expires, perfect. I will submit my entry soon. I would love to get my hands on the tea and cookies basket. My son’s adpoted grandmother broke her hip and he would love to give it to her as a great treat. Who doesn’t love chocolate? That’s the one I would pick. But I would pick the tea and cookies one for my favorite out of town friend. A Disney trip? Wow! I’ll have to give your question some thought. You and your sponsors are truly amazing! November sounds like a wonderful time to visit Disneyland. That is the best contest ever! I am so going to work on my 150 words!! I’m close to Disney world, so the trip out to Cali isn’t in our budget for this giveaway, but it’s awesome! Disney did well in picking you to go, I hope you and the fam have fun! I went once on the Tower of Terror, by myself (DH waited with our son and we took turns)…I don’t think I could do it again! I wish I could make it to your neck of the woods to participate in that great Disneyland giveaway, but don’t think it will be possible…we’ll be in FL at Disney World the week prior! But, it is a super cool giveaway and I’m sure whoever wins will have a blast with you and your family! Regarding the gift baskets, I would have to say the tea basket or the chocolate basket would be my favs, and I would probably send them to my in-laws. They do not live near us, and we like to send them little goodies to let them know we are thinking of them! That is a supremely cool giveaway! Too bad Nebraska is so far from Arizona!! Hey, Stephanie — You’re not gonna get me on the Tower of Terror! I’ll meet you at the teacups. :) Oh, and I’ll be joining you in the frizzy-hair club! We’re going to have a great time! Wow, Disneyland? I am going to have to email my submission pronto! As for the gift basket, I would choose the Chocolate one for my sister as a gift for the holidays. Thanks for this great contest! Oh Gosh, I can’t believe your giving the opportunity for one of us readers to go to Disneyland with you. Wow! That would be awesome! … and gift baskets too?! I would LOVE to win the Bubble Bath Spa basket. I would give it to my sister. She totally deserves it. She is a mommy to two adorable little boys, both under 3 and she is pregnant. She totally could use this. Disneyland at Christmas time sounds wonderful! This will be a great treat for a deserving person/family. I look forward to reading the five finalist entries and voting. For the basket giveaway I would choose the Chocolate Basket to give to one of my best friends who is an Airforce Wife and Mama – her husband has been in Officer Training for the past few months and she deserves a yummy treat for those stressful days that she’s been having. You have to be one of the most generous people in the world! You truly inspire me! Wow – that is an amazing giveaway! Congrats! Oooo, I have a friend who has been having a rough time with her kiddos – she would love the chocolate basket if I could part with it. Oh how my kids would just pop with excitement to go to Disneyland! Even though we live in So Cal we have not been in many years. My 6 year old can barely remember, and it’s my 4 year old daughter’s dream to go there. I keep telling her, “someday, we’ll go there”. Transportation would be easy for us, we’d just hop in the car and be there in under an hour! So, instead I would like to throw my name in the hat for the chocolate gift basket for myself. I’m big and pregnant and just need chocolate right now, lol! As much as I’d love to enter for the Disneyland trip the transportation from the east coast would just be too much. What a great giveaway though!! Wow Disneyland with you & your family? That would be awesome! Unfortunately… I’ll have to pass, we’re going to California for Christmas and transportation to there and back two times, just isn’t in the budget this year… oh well! I would love to get the Healthy Basket for my parents. They would love it and deserve something nice. What a great giveaway and how you are giving it away! Hello! I would love to win the Healthy Gift Basket Stack for my parents for Christmas! My funds are quite low this year, so Christmas shopping will be tough for me. Thanks for the offer! Yay!! I’m so glad that you get to see the Christmas decorations! The park is SO sparkly and beautiful for the holidays! Did you know that it magically snows after the fireworks? Your girls will LOVE it! For the gift baskets, I’d choose the chocolate to send to a friend who just lost a loved one. And of course I’m already a subscriber! What a great contest! I love Disneyland! And gift baskets! The tower of terros is SO scary!